Politically-correct "liberals" hate to be reminded of the contradictions inherent in their own position, especially where multiculturalism is concerned. Hence the abuse dished out to the likes of Ayaan Hirsi. 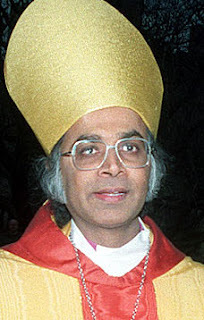 A particular bete-noir of the well-intentioned is Michael Nazir-Ali, the bishop of Rochester, whose Pakistani background sits ill with his well-publicised (he likes publicity) support for traditional British values. It is now less possible for Christianity to be the public faith in Britain. Not only locally, but at the national level also the establishment of the Church of England is being eroded. My fear is, in the end, nothing will be left but the smile of the Cheshire Cat. Much of this has come about because of a "neutral" secularist approach which refuses to privilege any faith. In fact, secularism has its own agenda and it is certainly not neutral. It is perfectly possible for Britain to welcome people on the basis of its Christian heritage. But he also aims some pointed barbs at the direction of Islam, and especially the separatist tendencies visible in Britain today. He made reference to campaigns for aspects of Sharia law, to the emergence of effective no-go areas for non-Muslims, and the "worldwide resurgence in the ideology of extremist Islam". Attempts have been made to impose an "Islamic" character on certain areas, for example, by insisting on artificial amplification for the Adhan, the call to prayer. Such amplification was, of course, unknown throughout most of history and its use raises all sorts of questions about noise levels and whether non-Muslims wish to be told the creed of a particular faith five times a day on the loudspeaker. his latest rant in a right-wing newspaper cannot and should not be forgiven. He seems to take pleasure in divisive rhetoric and stoking up hatred, this man of God who abuses the power vested in him. In the past five years Nazir-Ali has stood out against gay rights and the ordination of gay priests; he condemns multi-faith initiatives, and, most immoral of all, pronounced that the war on Iraq was justifiable. The effect of Nazir-Ali's comments is to suffuse toxic fear through the land, and is prepared to inflate, exaggerate and invent perils in order to push his particularly fanatical Anglicanism. The bishop is certainly unapologetic in his belief in the importance of Christianity in shaping British identity. In a separate interview for the BBC, he spoke of "the Judeo-Christian basis for almost all that is valuable about Britain today" ("Judeo-Christian", in this sense, usually just means "Christian"). No room here for Plato, Hume or Darwin, I suppose. He appears to think that the Church of England's dominant position gave a kind of spiritual underpinning to the notion of "one nation", in which people were encouraged to identify primarily with the history and traditions of Britain. When that goes, you're left with people looking for meaning, belonging and identity to a particular religion or ethnic group, rather than to the nation as a whole, which becomes an anonymous and neutral space, like an airport lounge. What actually seems to have happened, however, is that removal of the Church of England from its former pre-eminence has led to the privileging of all religions, and an increasing emphasis on "faith" as a source of identity. Thus religious leaders come to speak on behalf of, and give directions to, their "community". It is in this context, I think, that the amplification of the Muslim call to prayer should worry us. In areas which are already dominated by one ethnic group, and are thus effectively monocultural, the Adhan overlays a religious character on the existing tendency towards racial separateness. To outsiders, it says, "This is our community". But to the community itself, it says "You are, first and foremost, a Muslim". Similarly, the Church of England's "bishop for Urban Life and Faith", the Rt Rev Stephen Lowe, told BBC Radio 4's Today programme that he had never seen the kind of no-go areas Nazir-Ali described. "The vast majority of the Christian and Muslim populations that I know are working happily together," he declared. But why should a Christian bishop be so keen on promoting another religion? In a less mad world, we would be surprised if bishops didn't criticise Islam. After all, Christianity and Islam are not the same thing, their respective creeds are in fact mutually contradictory, and in many parts of the world they are deadly rivals. In Pakistan, where Michael Nazir-Ali (the clue is in the name) originally hailed from, the small Christian community lives in a state of near-permanent fear. Churches are burnt, anyone converting to Christianity risks death as an "apostate", blasphemy laws are invoked to prevent Christians preaching publicly. And the situation is even worse in Saudi Arabia, where even communities of foreign workers are forbidden from taking part in public acts of Christian worship. The Pope's notorious Regensberg speech in October of 2006 attracted similar criticism, while Prince Charles was applauded for enunciating his frankly absurd desire to be "defender of faith". Should we not be more worried, though, by religions joining together, temporarily burying their differences to gang up on atheists, agnostics and secularists, demanding "respect" and attention for their respective "superstitions"? I for one would prefer them to waste their rhetorical energies slagging each other off, and leave the rest of us alone.